Street Art is flavour of the year in Los Angeles, writes Liz Farrelly, thanks to a series of high-profile exhibitions. Jeffrey Deitch, previously a genre-busting gallerist, is now director of the Museum of Contemporary Art (MOCA). In his first year on the job, Deitch recognised that street art would fulfil his aim of ‘engaging new audiences’. This summer’s blockbuster exhibition ‘Art in the Streets’ did just that, delivering a record-breaking attendance figure of more than 200,000). In August, ‘Street Cred: graffiti art from concrete to canvas’ at the Pasadena Museum of California Art (PMCA), featured more than 30 LA-based street artists. Artist / writer Steve Grody (Graffiti LA: street styles and art, 2007) wrote that LA is now the ‘bona fide capital for street art in the US’, citing its cultural diversity, its graffiti-friendly (read ‘out of the way’) environments and ‘weather that makes most of the year available for mischief’. That may be the case, but ‘3 Kings’, the current exhibition at Subliminal Projects Gallery (hosted by Amanda and Shepard Fairey), provides LA’s street art fans with a history (and geography) lesson. 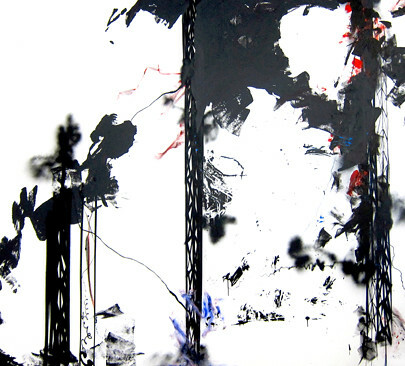 Top: Fred (Fab 5 Freddy) Brathwaite, Abstract Remix #1, 2011. Ink, acrylic, spray enamel on canvas; 29" x 19". Below: Lee Quinones, The Creation of Three Mile (Glenn Strange portrait as the monster), 1989. 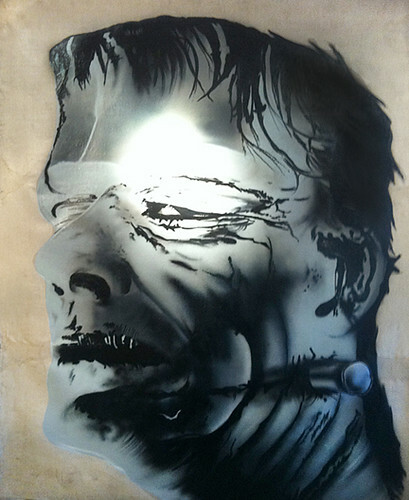 Spray paint on linen; 120" x 96". The three graffiti ‘kings’ are: Fred Brathwaite, aka Fab 5 Freddy; Lee Quinones, aka LEE; and Leonard McGurr, aka Futura 2000. Guest curator Patti Astor, founder of the FUN Gallery has drawn on the culture clash between ‘uptown’ (Bronx) artists and musicians and ‘downtown’ (East Village) film-makers and gallerists that happened two-and-half thousand miles away, in New York City, 30 years ago. 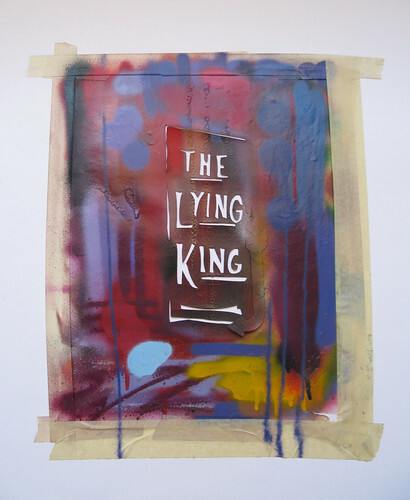 Below: Lee Quinones, The Lying King, 2009. Spray paint on cut out Arches paper; 25" x 20". 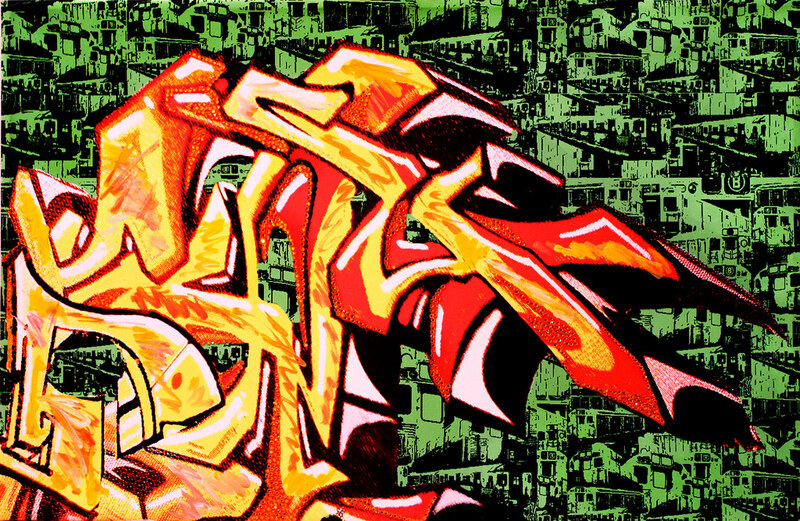 For the past three decades, Brathwaite, Quinones and McGurr have produced monumental graffiti pieces (Quinones painted whole subway cars, then entire trains, and was first to move to canvas); introduced stylistic change (McGurr pioneered abstraction and customized nozzles to deliver super-fine marks); and disseminated their art across media to audiences worldwide. Brathwaite (who co-starred in Blondie’s ‘Rapture’ video) hosted ‘Yo, MTV Raps!’ and co-created the movie Wild Style; Quinones’ 1979 show at Galleria Medusa in Rome brought street art to Europe; and McGurr’s collaborations with The Clash and James Lavelle (Mo’Wax, see Eye 33) attached a new visual language to popular music, creating some of the most sort-after sleeve art of the 1990s (in collaboration with Ben Drury). Futura also pioneered street art’s crossover into fashion and accessories, working with clothing and collectables brands in the US and Japan, including Project Dragon and A Bathing Ape. Below: Leonard (Futura 2000) McGurr, Panic Button, 2011. Acrylic and spray paint on canvas; 132" x 120". Curator Patti Astor, who once starred in low-budget ‘No Wave’ movies, opened FUN Gallery, the East Village’s first art venue (1981-85) with partner Bill Stelling. A tenement storefront on 10th Street between Second and Third Avenues, FUN introduced the roll-call of first-generation NY graffiti artists to protagonists who would kick-start careers and change lives, including artist Keith Haring, gallerist Barbara Goldstone, and Martha Cooper and Henry Chalfant (photographers / authors of Subway Art, 1988). Without FUN Gallery, and the early-80s downtown scene, New York’s nascent graffiti and hip-hop subcultures might not have made those cross-cultural connections with Punk, No Wave Cinema, photojournalism and underground art – the factors that brought it out of the Bronx and helped it grow into the multiple-media street art industries of today. With ‘3 Kings’, the artists have avoided a nostalgia trip by creating new works to hang alongside their classics. 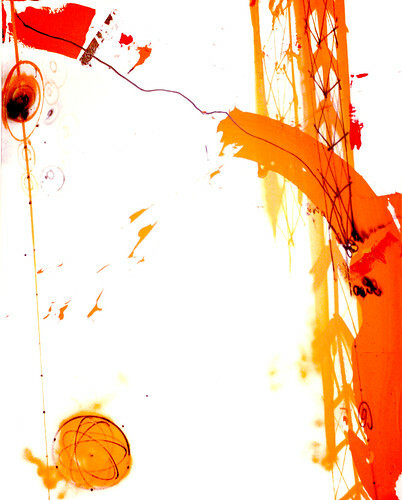 Below: Leonard (Futura 2000) McGurr, Orange Julius, 2011. Spray paint and acrylic on canvas; 60" x 48".